Children's Cries Brought Down Walls Of Indifference Thousands of migrant children have been separated from their parents by the U.S. government. NPR's Scott Simon reflects on audio recordings this week in which detained children can be heard crying. 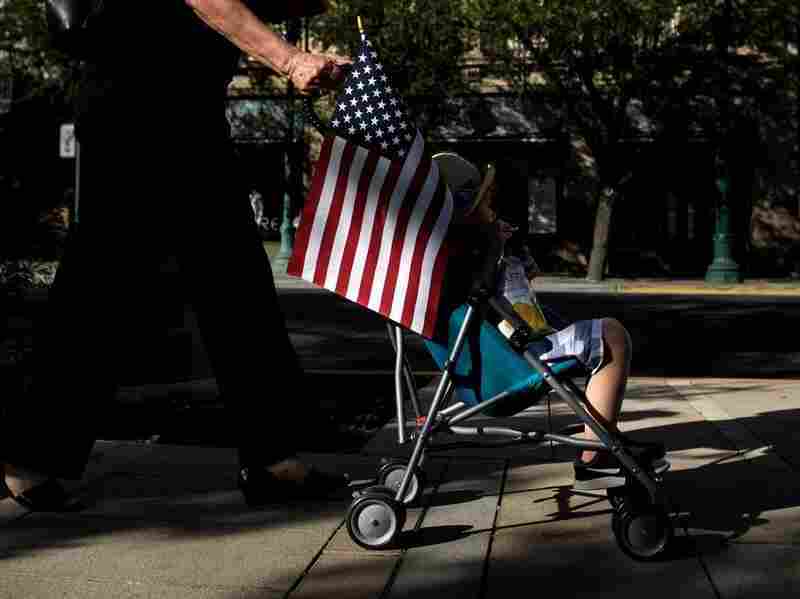 A child rides in a stroller during a rally in El Paso, Texas Thursday to protest the Trump administration's family separations. The cries of children pierce our hearts. Scientists say they're meant to. They move us to love and protect children. This response is healthy; it's human; and it keeps humanity going. As Dr. Marc Bornstein at the Eunice Kennedy Shriver National Institute of Child Health and Human Development told The Scientist, "the infant cry and the caregiver response, have developed together to ensure the survival of the species." Public figures, including the pope, bishops, senators of both parties, and every living spouse of a president spoke out against the Trump administration policy that separated more than 2,300 children crossing the border from their families. Laura Bush said the policy was "cruel. It is immoral. And it breaks my heart." But the cries of children, from a recording at a U.S. Customs and Border Patrol facility obtained by ProPublica, seemed to reach into and wrench so many hearts. The cries of children brought down walls of indifference. Politicians, including Republicans, rushed to distance themselves, if not outright denounce, policies that caused such manifest pain. Governors, including a couple of Republicans, withdrew their National Guard units from border areas to avoid being a part of those policies. Airlines said they would refuse to fly groups of children who had been taken from their families. Several airline attendants said they would walk off any flights that tried to transport those children, to keep them from taking off. The cries of children pricked consciences across the country. It made people look into their lives and wonder what they might do — what they should do — to help those children. The executive order signed by the president to end family separation apparently does nothing to reunite the 2,300 children who have already been torn from their parents. Reports place some of those children hundreds, even thousands, of miles away in detention centers that have not been opened to the press and public officials, save for a carefully approved visit of the kind Melania Trump made on Thursday. But we know — and must find a way to report — about the children and families who are still locked up and being kept apart. There are still cries to be heard.